Here’s a healthy and nutritious Indian Raw Cabbage Slaw with peanuts recipe that is fast, vegan, and tasty. Indian style raw cabbage peanut slaw This makes a great accompaniment to any meal. One of my favorite summer salads! I’m not really sure what to call this. I don’t even know if this is a proper Indian dish but I do know I’ve been making it for years, and my cabbage-loving husband devours it. It’s made pretty much like you’d make the Cucumber Koshimbir, except without yogurt (and of course, substituting cabbage for cucumbers). To make this easy on myself, I buy a package of ready chopped coleslaw mix which is usually cabbage and shredded carrots. I rough chop that mix, use my Kuhn Rikon Pull chop for the tomatoes, cilantro, and peanuts, and then I’m ready to just mix and season. If you want a cooked cabbage dish, try the Cabbage with Fennel Seeds, Cabbage with peas and carrots, or the Szechuan Pepper cabbage. 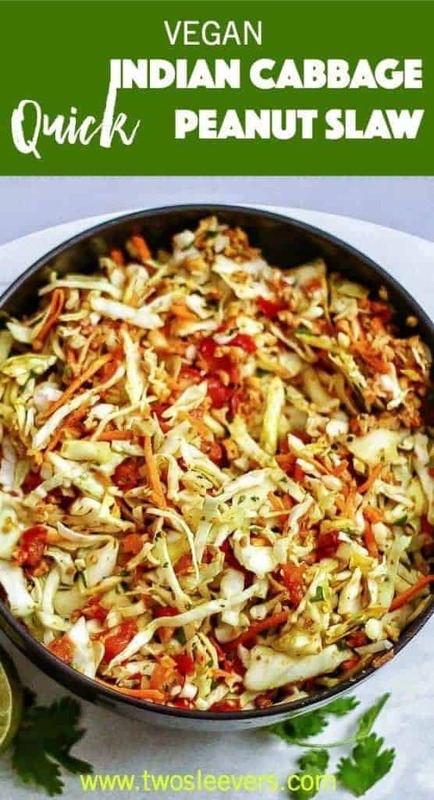 Here's a healthy and nutritious Indian Raw Cabbage Slaw with peanuts recipe that is fast, vegan, and tasty. Indian style raw cabbage peanut slaw This makes a great accompaniment to any meal. One of my favorite summer salads! Chop the tomato, cilantro, and peanuts into a fine dice. I use my trusty Kuhn Rikon pull chop which I love and it works on all of these equally well. Place all the vegetables into a bowl and season with salt and sugar. In the smallest little heatproof bowl you have, heat the oil until it is hot and shimmering. Add the turmeric and stir quickly. Pour this hot, flavored oil over the cabbage mixture and mix well. 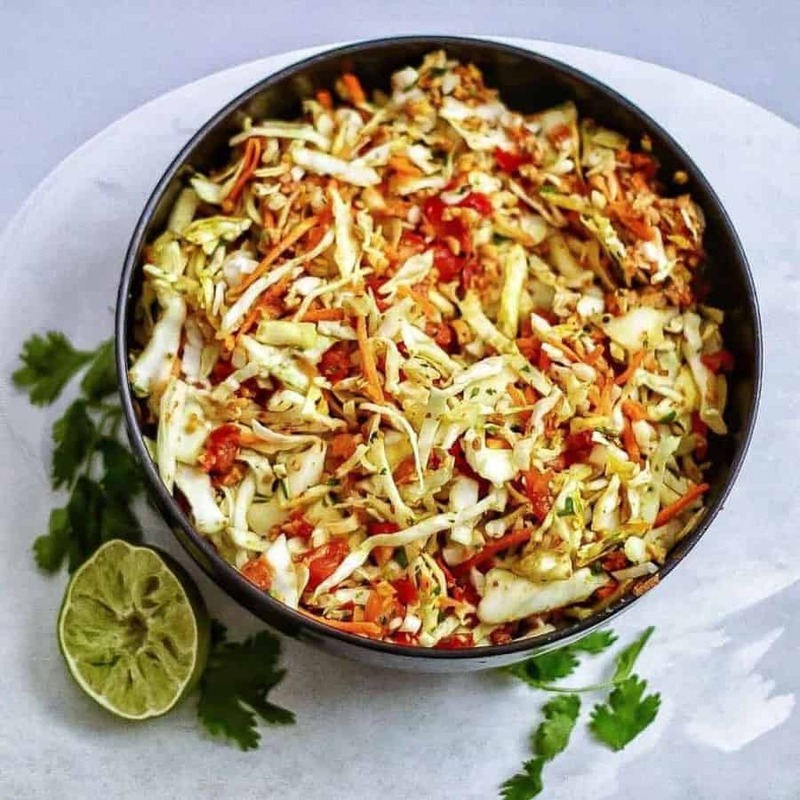 Here’s a healthy and nutritious Indian Raw Cabbage Slaw with peanuts recipe that is fast, vegan, and tasty. Indian style raw cabbage peanut slaw This makes a great accompaniment to any meal. I’m having friends over on Friday night, and I like to cook/prep everything a day or two in advance so I don’t have a last minute clean up before guests arrive. Can I make this dish in advance? Or will the slaw get soggy? Hi there. It is different the next day but not in a bad way. I love it fresh and I love it leftover too. I’m no help! Loved this slaw. I have been tossing in chopped tomatoes in my cooked cabbage for years, just never thought about it in a raw cabbage slaw! Would this work with the regular roasted, salted peanuts I always have on hand? I hate to buy the Spanish peanuts unless it’s necessary, since I don’t use them for anything else. Yes for sure. I’m not a fan of buying ingredients for one dish either. Killer good slaw and I had all the ingredients except cilantro on hand. Peanuts really add to it. Loved it!! Yay! You’ve made something very few people outside of india experience. Good for you! Made this for lunch. Delicious, and a nice change from traditional coleslaw. oh good! I made so much yesterday I have leftovers but it tastes better the longer it sits there. Glad you liked it.